Watch David Wise's gold medal-winning run as he becomes the first men's freestyle skiing halfpipe champion at the Sochi Winter Olympics. 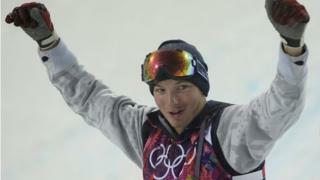 The 23-year-old American claimed gold thanks to a 92.00 score on his first run. Canada's Mike Riddle won silver with a score of 90.60 while France's Kevin Rolland (88.60) secured bronze.